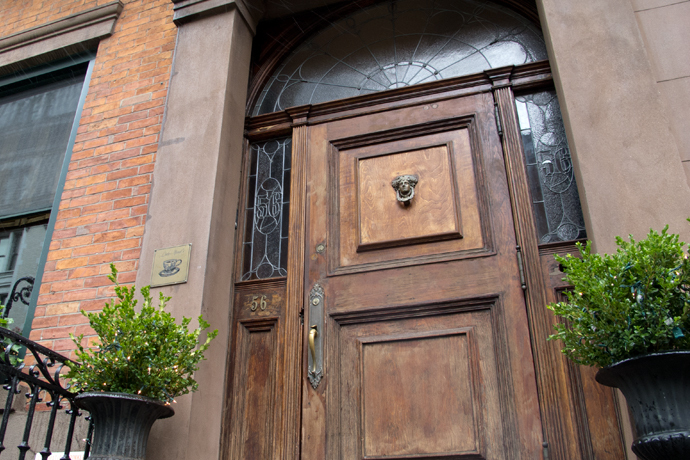 Inside a quaint brownstone in New York’s Gramercy Park neighborhood is Lady Mendl’s Tea Salon. 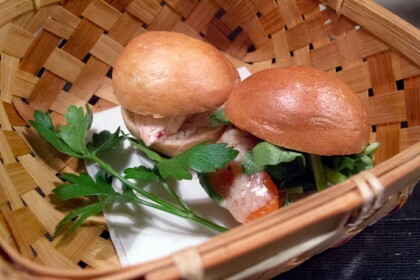 My review of the five-course tea service from start to finish. 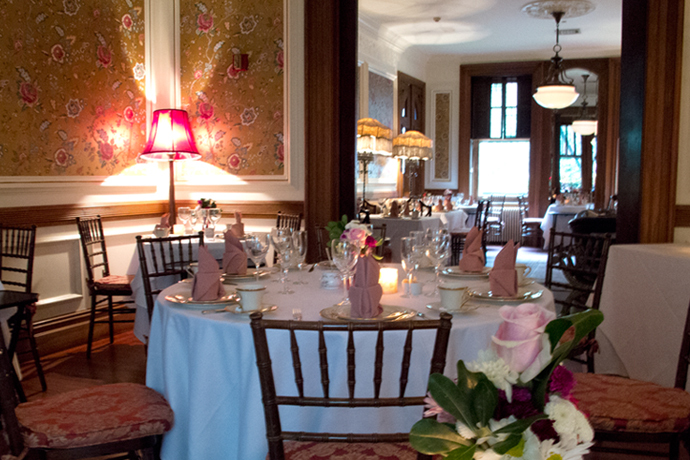 Lady Mendl’s at The Inn at Irving Place is easy to miss when walking down the street. Up the steep stairs of a brownstone is a tiny teacup sign to the left of the door that lets you know Lady Mendl’s Tea Salon lies inside. I’ve had tea at Lady Mendl’s multiple times over the years, including a bridal shower for a good friend and it was one of the first places I ever had afternoon tea. 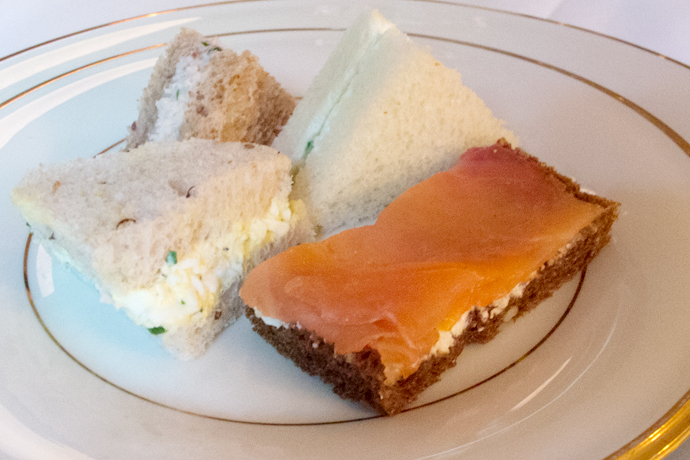 Lady Mendl’s has been serving afternoon tea as long as I can remember and in the same style of five courses. There is no mention that reservations are required but definitely make one before going. You never know if they’re booked and you don’t want to wait hours for the next seating. Let them know about any dietary restrictions when you make the reservation. Also, they don’t allow children under 12 to tea. What Do I Wear for Tea at Lady Mendl’s? I would suggest smart casual for afternoon tea at Lady Mendl’s. There isn’t a dress code but it’s my usual minimum when having tea anywhere. Smart casual is dressing neat and put together but still be comfortable and relaxed. How Does Afternoon Tea at Lady Mendl’s Work? 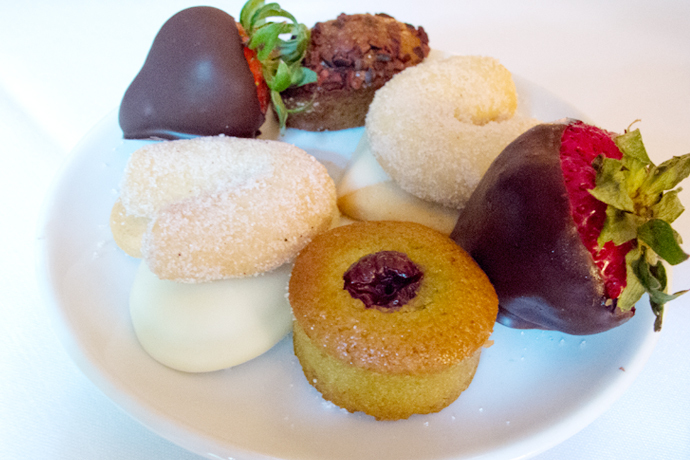 All afternoon teas are prix fixe, or set menus. The food you get is what everyone else gets. There isn’t a menu where you select what you want to eat. For the cost of one afternoon tea, you get a pot of tea and five small courses of food. Everyone must order their own afternoon tea. 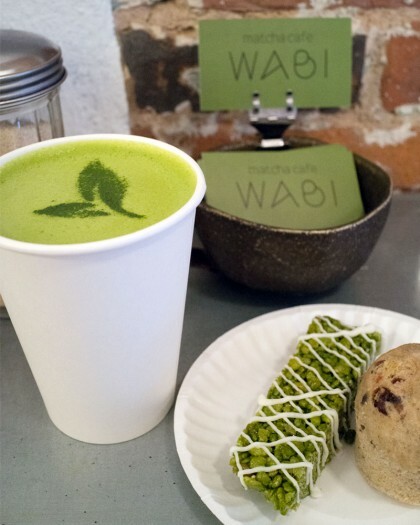 If you prefer vegan or gluten-free options, they offer that for an extra cost. The rooms are cozy and charming although it’s not as elegant or as pretty as an afternoon tea you would get at a high-end hotel. The waitstaff is fine but the flow of the courses was off. There were moments where we were waiting quite a bit for the next course, while others were brought out right away. One thing that really threw me off was being rushed out at the end. About two minutes after the last course was served, the waiter came by dropping off the check. Then five minutes after that, we were told the kitchen was closing and were basically asked to leave. I’m used to a two hour tea service, so it was bit jarring to be rushed out after an hour and a half. There are only six teas on the menu so the selection is very limited. I would give it more stars if there were at least 10 to choose from and if there were pure, whole teas rather than blends. 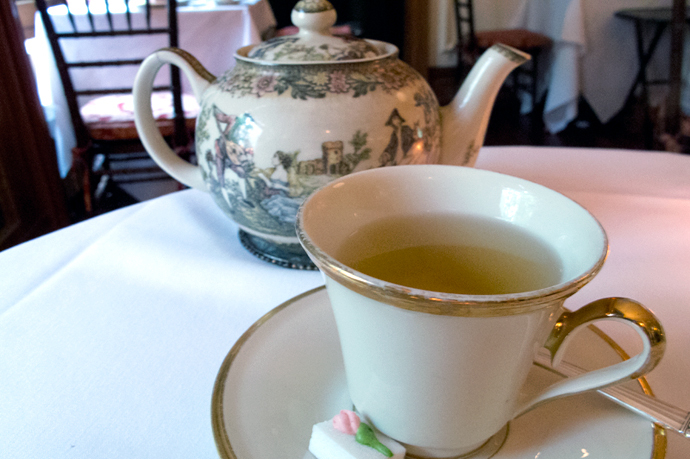 Lady Mendl’s tea service is different than most since it’s made up of five courses, instead of three. 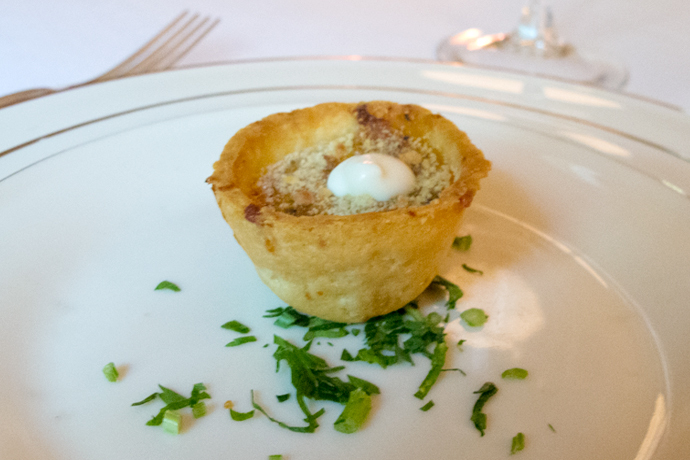 You start with an appetizer course which varies seasonally. It was a butternut squash tart which was bite-sized and tasty. The next course of tea sandwiches were served by the waitstaff from a hand-held tray filled with four different kinds of sandwiches. They’re traditional and although really basic and a little homemade looking. 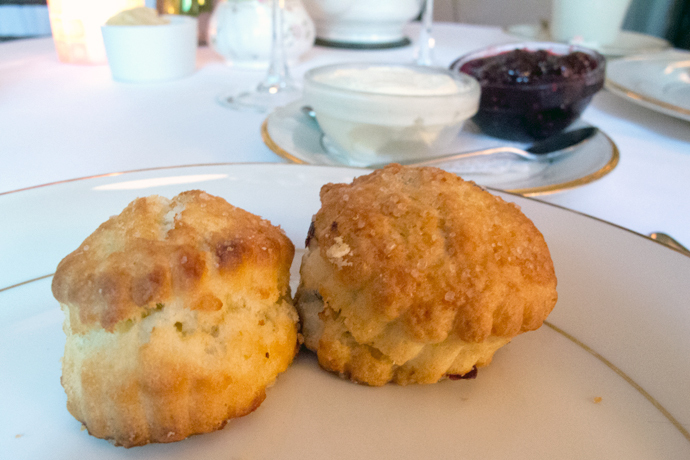 Scones, a cranberry and a butter, come next and they were served with Devonshire clotted cream and preserves. Good, although I wish they had been warm. I love warm scones. There are two dessert courses, the first, a slice of the Lady M Mille Crêpes followed by a cookie plate with chocolate covered strawberries. 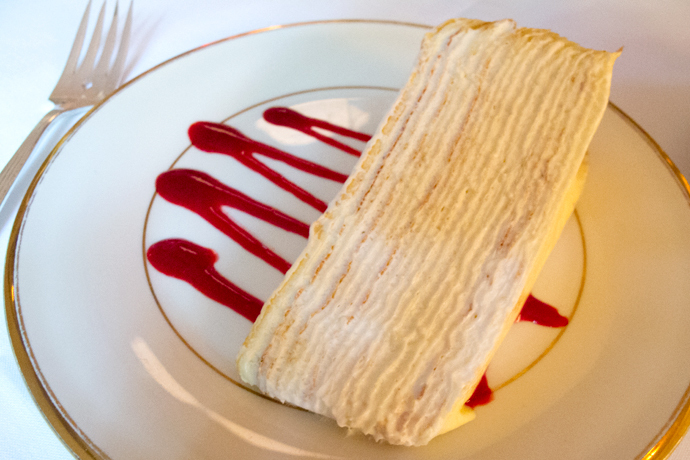 Lady Mendl’s is where I first had the crepe cake and fell in love with it. At that time, I didn’t realize that they were from Lady M and was just exclusive to Lady Mendl’s so every time I went back, that course was the one I looked forward to the most. The assorted cookies and chocolate covered strawberries seemed a bit of an afterthought but I did like the heart shaped cookie with white chocolate. Tea at Lady Mendl’s has been a NYC afternoon tea hidden gem for so many years but they’ve been going down a bit. 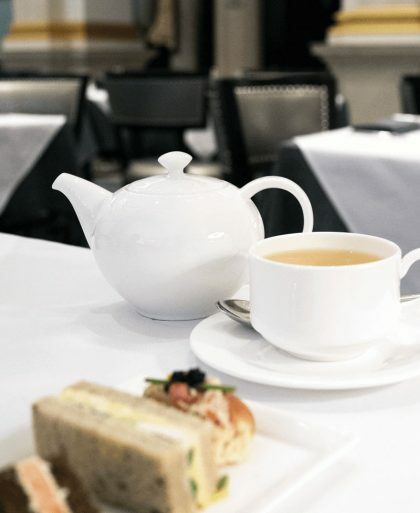 Despite some negatives, the price is reasonable compared to other afternoon tea offerings in Manhattan and the setting is perfectly suited for tea. I wonder if you have been to Lady Mendl’s lately? I originally wanted to go the the Plaza, but was warned against it, because of it’s touristy feel and outdated looking decor. My friend highly recommended Lady Mendl’s because of the beautiful settings, I also read your review of the Pembroke Room, so now I’m really unsure, which place to pick. I want a gorgeous place, with genteel ambiance, that’ll make me feel like I’m in Downton Abbey, hehehe. Something very grand and elegant, but not snobby…can you help me choose? Hi Alfie, I haven’t been to Lady Mendl’s in a while but I was at the Pembroke Room two weeks ago. Both places have a genteel ambiance, but between the two, I like the Pembroke Room better since it’s a bit more upscale. Thanks for your very prompt answer; I will definitely look into the Pembroke Room. I’m going with my teenage daughter, who is used to drinking tea since toddlerhood, and now is an avid Downton Abbey fan, so I want it to be very special for her. Hi Alfie, now I’m leaning more towards Lady Mendl’s since it does have more of a Downtown Abbey vibe. Argh — I’m not much help here am I?